What’s going on with North Korea? That’s the question everyone is asking, but not getting any factual answers to. Any bourgeois analysis is (at best) conjecture, which is useless. Can anyone explain why Donald Trump keeps flipping his position on North Korea? I can, and here it is. 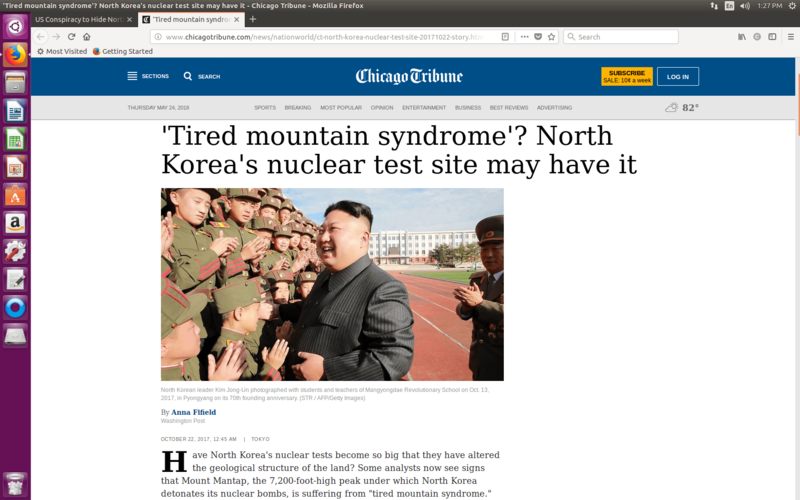 This mess began on September 3, 2017 when an underground nuclear test at Mount Mantrap in North Korea collapsed the mountain, killing over 200 workers and causing a “Chernobyl-like meltdown” of the facility. This tragic mishap instantly wiped out North Korea’s nuclear capability. I published my account of all this on November 5, 2017. North Korean leader Kim Jong Un is known for his regime of repressive state censorship, so it comes as no surprise that he would hide this accident, and there have been no official reports of this catastrophe in any North Korean media. The true conspiracy is the fact that the US-led media in the West has chosen to censor this fantastic story. There can be no doubt that every nation’s intelligence apparatus around the globe knew/knows of this event. Even Russia Today (RT) is censoring this story, as there are explosive international ramifications. 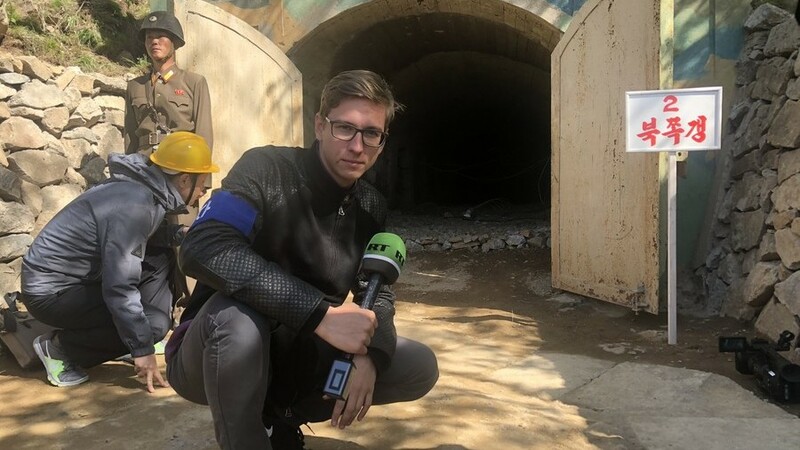 Below is a RT story on the recent team of international journalists that went to North Korea’s secret nuclear test site to witness its “demolition. ” It is their only one that even mentioned the possibility of the September 3, 2017 accident. It did not report it as fact. I conveniently copied & pasted this story when I first read it, as it mentioned the nuclear meltdown in its final paragraph. It has since been edited, to hide that fact in the middle of the story. No other Russia Today story mentions this event, to date. After a two-hour charter flight from Beijing, RT’s Igor Zhdanov and a small team of international journalists have arrived in North Korea, where they will witness Pyongyang close its only nuclear test site at Punggye-ri. After Tuesday night’s trip to the nuclear site was called off, the team is staying in the resort city of Wonsan overnight. When they finally reach the nuclear site some 600 kilometers away, the Kim regime has promised a spectacle. “The whole site will be razed to the ground and technical buildings reduced to rubble,” North Korean officials said. The destruction will be witnessed by a group of around 20 journalists from Britain, Russia, China and the US. South Korean journalists were snubbed after Kim cancelled a summit with South Korean President Moon Jae-in last week in response to joint military exercises between the US and South Korea. While the closure of the Punggye-ri site is a much-touted gesture of goodwill, it is unclear if the site even remains usable. Following a powerful nuclear test there last year, a collapse left as many as 200 North Korean laborers dead. The journalists were delayed a day by bad weather, so the site wasn’t reached until May 24. The “demolition” was photographed, and explosions were made. 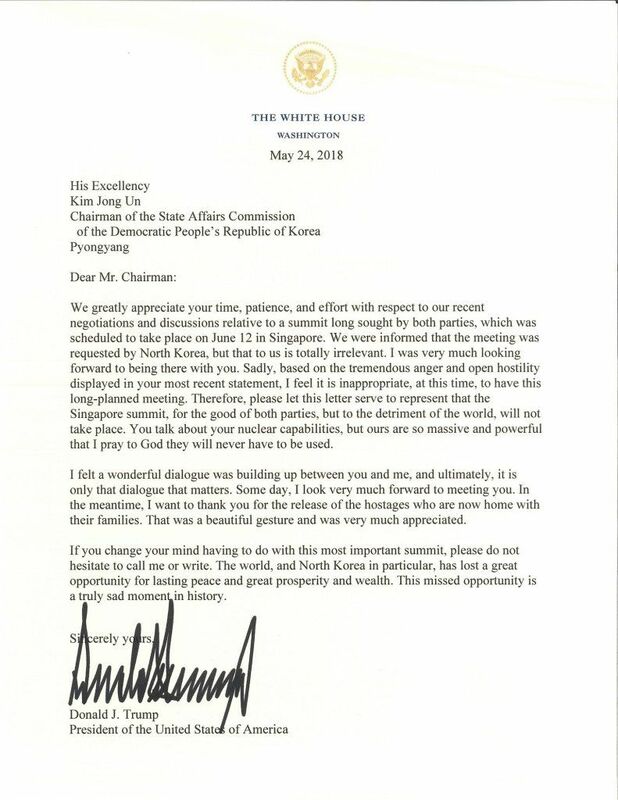 The Trump administration responded by canceling the summit, in this public letter shown below. There was a lot of fanfare that went with it. Then…. yet another zig-zag from the Trump administration, which has been caught with their pants down. They wanted “maximum pressure,” but (of course) it blew up in their faces. 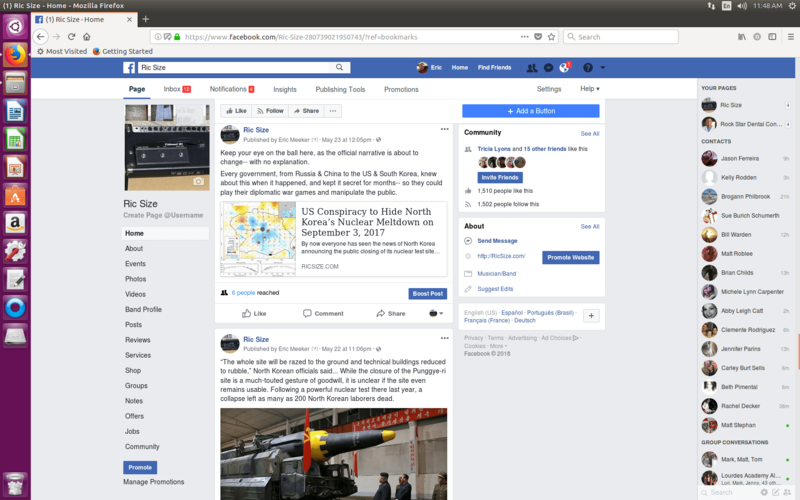 Actually, it blew up in North Korea on September 3rd, 2017, a disaster that is now widely known in the media, but yet still isn’t being reported. Why is that? The upshot is that everyone now knows the North Korean military has no nuclear capacity. Thus, Trump can’t posture tough anymore, without looking like the bully picking a fight with a defenseless enemy. That’s why he’s “re-thinking” the summit, which he must attend. Got all that, James Cogan of the World Socialist Web Site?! Conclusion: This lack of dialectics & clear Marxist analysis on US/North Korean diplomacy is creating dissension among WSWS readership. That creates openings for unprincipled agitators to wreak havoc. Taking a wait-and-see approach to the facts, while interpreting Trump administration press releases as serious business, is bourgeois reporting. Marxists seek out & uncover the facts, then rationally & scientifically analyze them to discover the truth; so when 2+2=? presents itself dialectically, they can surmise the answer to be four. Political careerists always fail at this, proving the WSWS needs more dialectical revolutionaries in its ranks & leadership. That’s where the working people of the world are with North Korea, and US intrigue diplomacy.